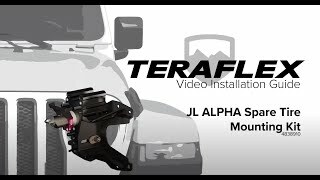 Designed to accommodate up to a 39” tire (with additional tailgate reinforcement), the TeraFlex JL/JLU: Alpha HD Adjustable Spare Tire Mounting Kit w/ 3rd Brake Light Mount & Rearview Camera Mount will secure your full-size spare tire over the most extreme trails and rugged terrain. Mounts to the factory tailgate. Complete adjustability includes vertical as well as fore and aft adjustments. The heavily gusseted tire mount is formed and welded from CNC laser cut steel for superior strength, while the adjustable tire carrier is constructed from strong and lightweight 6061-T6 extruded aluminum. • Tire size fitment and aftermarket bumper clearance varies by manufacturers; please confirm fitment before purchase.